The Navitek* welding helmets combines a large clear visor to a pivoting front frame hosting the autodarkening filter. The Navitek* is fully certified EN 166 B and EN 175 B for welding and grinding applications. S4 and S9 autodarkening filters are fit for the Navitek*. 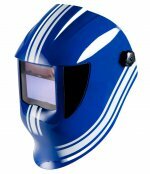 The Navitek* welding helmet is available with or without side vision in shade DIN 5 polycarbonate. Side vision offers full control of the close environment of the welder, for increased safety and advanced confort. The Kapio* welding helmet is the perfect combination of light weight and excellent ergonomics. All Weltek* autodarkening filters are fit for the Kapio*: S3, S4, S9 and S13. 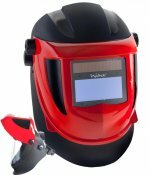 In addition to being available with or without side vision in shade DIN 5 polycarbonate, the Kapio* welding helmet is also available in a large selection of graphic designs.